The origin of the Irish Setter is not known, although it is believed that it evolved from a combination of land spaniels. These were imported to Ireland from Spain when the Spaniards helped the Irish in their rebellion against the British. It should be noted that this breed (which was established as early as 1800) was not originally a solid colour, but a combination of red and white. Through selective breeding the rich, mahogany red colour we know today was derived. 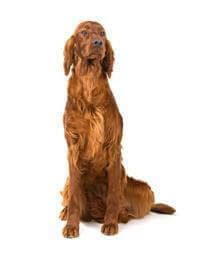 Irish Setters were originally used to ‘set’ game, hence the name ‘setters’. They found upland birds and crouched down close to their find so that the hunter could come and throw a net over dogs and birds. When firearms were introduced, this practice was discontinued, as the hunter wanted a dog that pointed, flushed game and hunted with an upright stance. Irish Setters live from between 10 to 14 years of age. The Irish Setter is an independent, but sweet-natured dog with a rollicking personality that makes a wonderful, loving companion. Shyness, hostility or timidness is uncharacteristic of this beautiful breed, which is best known for its outgoing, stable temperament and strong hunting instinct. Remember that this breed has a high energy level and requires regular exercise. It is essential that an Irish Setter be regularly groomed. The coat should be brushed to keep it free of dirt, burrs, snarls and matts. Brushing also stimulates production of natural oils, giving the coat that beautiful characteristic mahogany gloss. Always seek someone who is familiar with the breed to assist you when acquiring an Irish Setter puppy, and make sure you pick a pup with a happy outgoing personality. An active dog, the Irish Setter requires a certain amount of daily exercise and attention to grooming.